There is a good reason or this. 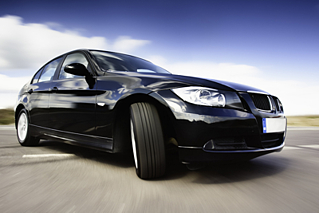 With the possible exception of the driver, the tire is the most highly variable component on any car. Author Paul Haney sums it up quite well when he asserts that “...the pneumatic tire is an irreplaceable component in any road-vehicle system and is so extremely complicated as to defy detailed analysis”. In a road car, 100% of a driver’s intended control forces must assume authority over two metric tons or thereabouts through four tires – or more specifically: four tiny, constantly distorting contact patches that happen to briefly touch the underlying road surface once per wheel revolution. Tires are inconsistent, donut-shaped cocktails of rubbers, fibers, metals, and other materials. It is known and accepted that they change chemically and mechanically over time, even while a car is being driven. And yet, somehow, on a macro-physics level most people are perfectly adept at interacting with these nebulous things called tires, to the point of being able to detect the subtle cues about vehicle behavior and trajectory that are mysteriously and continuously transmitted through the contact patches. But when it comes to advanced simulations as mentioned above – the cornerstone of the virtual sign-off process – the idiosyncrasies of tires are an engineer’s worst enemy. How can the physical complexities of a tire and its interaction with a roadway surface possibly be formulated mathematically and then processed in real time? In cases where human interaction and/or control system co-simulation is a part of the virtual verification process, an answer is certainly required. In most cases, tire models are derived from various types of indoor tire test machines. The subtlety of this is two-fold: (1) A tire must physically exist in order to be measured and characterized, and (2) Mathematical tire characterizations are tethered to the imposed lab test conditions. If we wish to consider tire behavior outside the measurement range of a particular lab test, we must extrapolate or make approximations. So it goes. For now, let’s assume we can accept this methodology and derive some useful tire models. What then? That said, some advanced simulations and driving simulators will actually incorporate something like a ‘tire simulator’ sub-element within a supervisory simulation – not just in terms of tire physics model execution on dedicated computational cores – but in terms of state modeling. If the simulation architecture can support this, multiple, switchable states of a tire can be present within a single simulation or experiment. One example would be using a thermal tire model in one segment of a (virtual) proving ground and an empirical tire model in another stretch, all without breaking stride. Of course, this approach becomes especially challenging when the simulation requires that a real person be “in the loop,” as is the case with DIL simulation , since any sudden "step" can violate driver expectations and ruin the illusion, so to speak. Comments in recent literature suggest that both tire companies and vehicle constructors recognize the need to develop more representative real-time tire models with humans in the loop. After all, tire designs and developments are intimately connected to human sensory responses and subjective evaluations. But all parties admit that there is a way to go before this can be fully realized across all the required development areas. Time will tell whether the science (and art) of tire characterization and modeling can dovetail more seamlessly into virtual sign-off processes, DIL simulations, and so on. Cross-industry cooperation initiatives such as the OpenTIRE library (which aims to accelerate progress in tire modeling) will certainly be a part of the advancements to come. Along the way perhaps we'll even uncover some of the fundamental, first-principle mysteries about how tires actually do what they do!